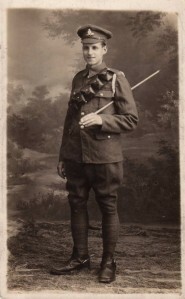 Hartley enlisted on 9th December 1915, at Burnley. At the time of his enlistment he was bookkeeper in the Harle Syke Mill. At that time my mother, his only child, was 11 months old. He had been married for 5 years and the 10th of December was his wedding anniversary! He was lucky. 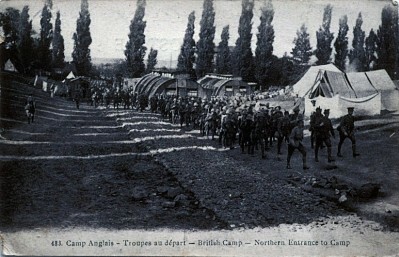 He joined the Royal Regiment of Artillery (regimental number 244152). He was initially put into the Army Reserve as a private and was not mobilized until September 1917. On mobilization he was posted to the Royal Field Artillery as a gunner attached to 8a Reserve Battery, which was posted to 3c Reserve Brigade. On 5th Oct. 1917 he transferred to 5 Reserve Brigade in the Royal Garrison Artillery (regimental number 192866), and was immediately posted to the Egyptian Expeditionary Force. 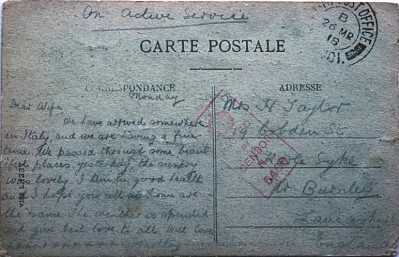 On 18th March 1918 he left for Egypt, passing through a “Rest” camp in Italy when he wrote the postcard to his wife. He is listed as being with the Egyptian Expeditionary Force from 3.4.18 to 5.9.19. While in Palestine he caught malaria, and was discharged on 6.11.19 with a short-term disability pension. Though predicted to recover completely, he had recurrent bouts of fever throughout his life and my brother can still picture him in bed shivering and shaking from one of these. My grandfather had a number of other mishaps while in Palestine. He was kicked by a mule and lost his front teeth. He was also bitten on the neck by a scorpion and, I was told, nearly died from this. He also told me a hair-raising story of being ambushed and of having to muffle the mules’ feet in order to escape quietly. But, as I said, he was one of the lucky ones. He came back. Hartley Taylor was the son of John Taylor (1857-1926) Manager of the Harle Syke Mill (appointed on its expansion in 1904) and the grandson of the Hartley TAYLOR (1820-1881) of South View who set up as one of the 7 firms in the Harle Syke Mill in the 1870s, as mentioned on page 65-66 of “A Lancashire Township” by Roger Frost.